Happy Friday everyone! I was really happy to dip my toes into refashioning this week and decided to tackle a jacket that's been in my closet for awhile but that I don't really wear that often. It's a lovely colour and I really like the fabric (linen look) but it's not quite the right style for me. 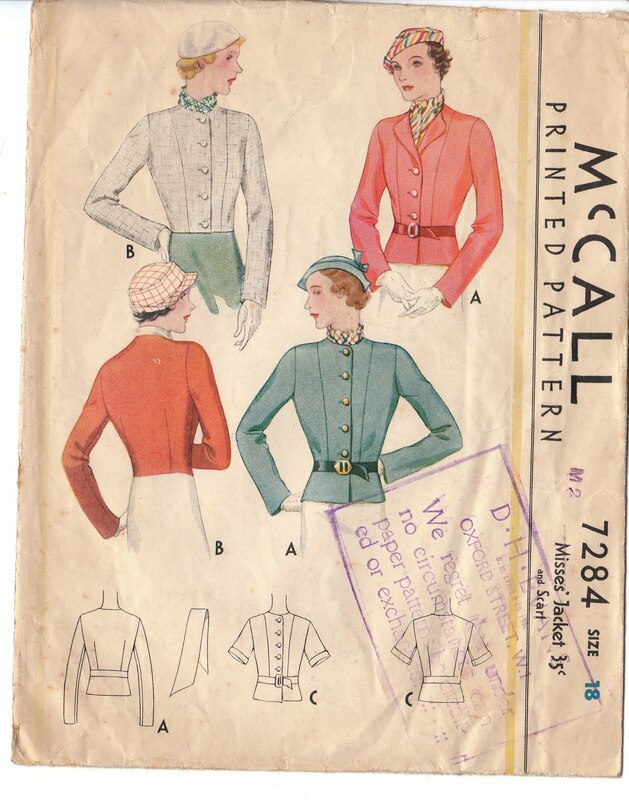 I decided I was going to try and make it into an early 1930's jacket and use McCall 7284 as my base. This pattern is also this week's giveaway. Leave a comment on this post by midnight GMT tonight for a chance to enter! I really like it! I love the front princess seam and the shorter length. I love the more fitted sleeves. True to the time period, this is a really short jacket (I used View B) and goes best with high-waisted pieces like my 1941 trousers from the Simplicity repro pattern. Luckily, I had some of the nice lightweight wool left over from the trousers to make the matching neck scarf...LOVE it!! I kept the original jacket's front facings, buttons and buttonholes, back darts and cuffs. I redid the neckline and shoulder caps and added the front princess seam. I also added a snap at the bottom of the jacket since I had to cut the last button off since it was literally on the bottom seamline! PS. Love your trousers too! Debi, I love the new jacket and the pattern. It is so classy and looks great on you. A huge improvement, I love the new version of the jacket. Very cute! You did a fantastic job, Debi. I'm really impressed! I love the details and how fitted it is. It looks great on you! Wow - that's fantastic! The new jacket is so flattering on you! Isn't it fantastic what opportunities knowing how to sew can create! great job, love it in its new incarnation! I love the idea of covering your seams with bias, it adds a really nice detail. The cuffs look great too! Your jacket is gorgeous I much prefer it now. You have such patience to unpick all those seams but it's been worth all that work to have such a lovely jacket. I can't wait to hear what your news is, and you looked lovely in your dress yesterday. Really great refashioning. It looks fantastic!!! Wonderful job Debi! Way to go. I love unlined jackets. They are easier to move in. Looks great at the shorter length. I think this is the best refashion I have seen this week, it is fantastic!! It looks so much more flattering. You did such a great job. I love the cuffs. What a great refashion Debi, the fit is really spot on now. Looks fab! Beautiful refashion looks so much nicer on you. What a great refashion! It really suits you and fits you beautifully! It's so lovely! I love this color on you. The binding on the inside seams is a lovely touch! I may have to try that myself :) Excellent work, dear! Super job with the refashion - looks great! I haven't tried my hand at refashioning much, so I really couldn't imagine what you might do! You went to a lot of work (more than taking in the side seams, as you said) but the end product is perfection! Oh WOW! I love the new jacket, it's amazing how much better it is. A lot of work, but boy was it worth it! Congratulations! Just beautiful! The fit is spot on! So much more flattering! Well done! So cute! So far my fav! You are so fun, I love the way you approach the vintage/refashion challenge. Your eye is perfect for the end result! This is so much nicer I am blown away by it and all the work you put in. I must say you do have tons of patience to accomplish this make over. I just ordered a pattern similar on Etsy it's called a Bolero and from the 40's as I love this style. Awesome job on the refashion, it looks so much more you now! And you couldn't get any more 40s than refashioning from old clothing. One of my favourite chapters in an old (1948 I think) sewing book is taking a toddler dress and recycling it every few years until the child is about 12! Not really sure if you could manage that with the same dress, but great concept all the same! I also think you've just helped me reach a fashion ephiphany. I've always loved jackets and tailoring but never quite felt right wearing them, "dowdy" more like. After looking at this I realise the problem might just be length and fit, I need to try this look, I think it would make me much happier. It's the perfect compromise between classic jacket and bolero style. This turned out really nice. I like a longer sleeve as well. Wow! What a great way to reuse, reduce, and recycle! I am very impressed and your 30s style jacket looks wonderful on you! An inspiration! What I really love is how you also re-did the interior. wow and double wow! It is a wonder transformation! A vast improvement! You look lovely! Funnily enough I was just looking through some of my old books a couple weeks ago at the suit-refashion ideas. Love how you applied this to a jacket! The new version is so chic and fits you beautifully. Bravo! Such an improvement! It now looks fabulous and so you. Stunning! Way to take a ho-hum jacket and turn it into a beautiful piece that looks like it will be very much at home in your wardrobe. Love it! Debi, your sewing skills and creativity never cease to amaze me!! This looks fantastic on you. What a turnaround from something that otherwise was a bit blah! You are such a rock star! That looks awesome. I wish I had your talent (and chutzpah) for making something that's ok into something amazing. And the fact that it only took you 5 hours - that would take me 60 million years to do and not like 1/2 as nice. Thanks for sharing your incredible work!